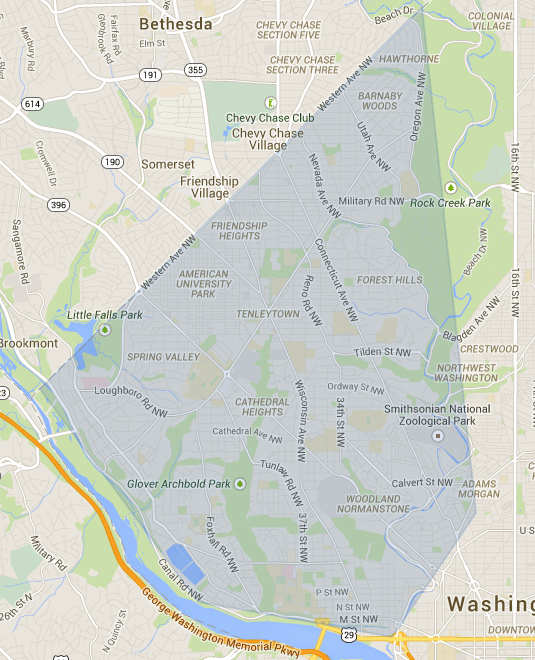 Fetch Coffee Brings Starbucks to Your Door | Tenleytown, D.C.
Posted on February 3, 2015 by Tenleytown, D.C. Fetch Coffee is the brainchild of Tony Chen, a Montgomery County native who gave up a job at Capital One to become an entrepreneur. The new service delivers a fresh Starbucks coffee drink of your choice to your home or office for the cost of the beverage plus a $3.00 delivery fee (and $0.18 delivery tax). The online order form has a clean user interface making it remarkably easy to use. You can pre-order your morning caffeinated beverage for delivery at the time of your choice between 6:00 a.m. and 9:00 a.m. Fifteen minute delivery windows mean you won’t be stuck waiting around for your coffee. Fetch Coffee also has a “Get Coffee Now” option, which is their same-day service offered until 8:00 p.m. There is a one hour delivery window to receive your coffee, though, making this category something of a misnomer. Fetch Coffee offers drip, iced, latte, mocha, and Americano coffees. However, if you like your coffee beverage a bit, shall we say, complicated, then the current menu options might not fully meet your needs. Flavored syrups, not to mention whipped cream or other toppings, currently are not an option, nor are blended drinks. Once I placed my order online, I received a confirmation text and an email shortly thereafter. It’s as if Fetch Coffee knows how panicked coffee drinkers can be about making sure they get their morning caffeine. Even more reassuring, Fetch Coffee sends a text two minutes before arriving at your door. Not only do you have the comfort of knowing coffee is on the way, you can make sure you have your robe handy or aren’t in the midst of brushing your teeth or some other part of your morning routine when they show up. At the appointed hour, Tony himself delivered my large latte to my front door. It arrived still in its original Starbucks cup inside a small thermos, which Tony quite cheerfully (perhaps he’s fueled by a few of those caffeinated beverages, too) opened, handing me the cup sealed in a plastic bag. I was impressed that the drink arrived on time, piping hot, and with zero spillage. I must admit, I felt more than a little bit indulgent as I sipped my hand-delivered coffee. Did it taste good? Absolutely. Did I enjoy the novelty of it? Indeed. Was it $3.00 better than a coffee I could have gone out to get myself? Probably not. And therein lies the challenge for Fetch Coffee. Yes, there are plenty of busy people who don’t like having to wait in line at Starbucks or another coffee shop for their morning joe. But I’m guessing a lot of those people would rather invest in a really good coffee pot or espresso maker over a delivery service. Especially as the $3.00 delivery fee is pretty steep on top of an already costly cup of coffee. If you are a daily coffee drinker, getting your beverage delivered by Fetch Coffee would add $1,095 a year to your coffee tab, which may not be worth what you save in time not having to wait in line. In addition, for that amount you could purchase 422 large drip coffees or, at the higher end of the menu, 213 large mochas from Starbucks. Reducing the per beverage delivery fee or offering a discounted subscription service could make Fetch Coffee more attractive. I might be inclined to sign up for a Sunday only subscription service to be able to enjoy my favorite “fancy” coffee drink each Sunday morning as I read the paper in my pajamas. A subscription to Fetch Coffee might also make a nice gift for sleep-deprived new parents, for students during exam week, or for young professionals or interns whose budget doesn’t quite include the splurge of a latte. Fetch Coffee also has a few other issues to work out. Currently, you can’t choose to have more than one beverage delivered per order, so your partner or roommate is out of luck unless you place a separate order and pay another delivery fee. A deficiency my husband was quick to point out when my coffee arrived and he remained empty handed. Then there is the fact that Fetch Coffee only offers Starbucks coffee. Nothing against the international coffee chain, but I, and I imagine a lot of others, prefer to support local coffee shops. I might be more inclined to invest in a delivery fee if I knew I was also helping my neighborhood coffee purveyor. While Fetch Coffee is in the proof of concept phase it probably makes sense to go with the ubiquitous Starbucks rather than try to partner up with individual neighborhood-based shops. Down the line, though, getting away from corporate coffee could give Fetch Coffee a boost. I admit I like the idea of coffee delivery, and Fetch Coffee gets high marks for customer service. But for now, while the novelty of having Starbucks arrive on my doorstep is kind of fun, without some tweaks to the pricing and ordering options I probably won’t be a regular customer. What do you think about a coffee delivery service? Have you tried Fetch Coffee? Share your thoughts in the comments section.